Grain refinement is an established technique which basically reduces the grain size of the material with the direct intention to improve its finished properties or characteristics. The addition of boron specifically in aluminum castings, which are well known for their poor mechanical properties, can improve these characteristics to expand the potential use of the castings to a multitude of other applications. Grain refinement is a well-established process for many cast and wrought alloys. The mechanical properties of various alloys could be enhanced by reducing the grain size. Refinement is also known to improve casting characteristics such as fluidity and hot tearing. It is well known that metals and alloys usually solidify with coarse columnar grain structure under normal casting conditions unless the mode of solidification is carefully controlled. It is possible to develop fine equiaxed grains in the as cast structure either by increasing the number of nucleation sites or by grain multiplication. McCartney has defined grain refinement as deliberate suppression of columnar grain growth in ingots and castings and formation of fine equiaxed solidification structure throughout the material. It is known that the grain size is inversely related to the degree of undercooling due to an increased nucleation rate. In other words, fine grains can be achieved by fast cooling that ensures a high degree of undercooling. Addition of boron using Al–4B master alloy to AZ91 alloy leads to significant grain refinement. This is attributed to the presence of AlB2 particles, which act as heterogeneous nucleation sites for the magnesium grains. The maximum grain refinement (from 100 to 30 m) is accomplished with 0.032 wt% boron addition. Due to the grain refinement and the presence of fine and uniformly distributed AlB2 particles, the boron added alloys exhibit improved mechanical properties. These findings will broaden the application of AZ91 alloy to areas where better performance is a requisite. Also, it is well known that aluminum castings with a large grain structure have poor mechanical properties which are primarily due to casting defects as opposed to fine grain structure. The grain refinement practice using chemical addition is well established for wrought alloys, however in the case of casting alloys, the practice of adding grain refiners and the impact on castability is not well established. The addition of well-known Al-5Ti-B grain refiner to casting alloys with silicon (Si) content above 3 wt.% is not effective. This is believed to be due to the chemical reaction between Ti and Si. The current research aim is to find an alternative, but effective, chemical phase which can refine Al-Si alloy grains. In the paper of H.D.Alamdari, D.Dubé and P.Tessier, the grain refining mechanism of boron particles was studied by observing the behavior of boron filaments immersed in Al-Ti melts in different conditions. Boron filaments were immersed into liquid aluminum having different concentrations of titanium (between 0 and 500 ppm) and the microstructure and composition at the B/Al interface were investigated. Boron filament was used to facilitate the observation of the Al-B interface. The results showed that boron dissolves rapidly in pure aluminum. However, a concentration of about 100 ppm of Ti inhibits its dissolution. When boron comes in contact with titanium containing melts a thin layer of TiB2 crystallites is formed at the surface of boron and protects it from dissolution. The boron surface is therefore covered with very fine TiB2 crystals having different crystallographic orientations. The TiB2 layer thickens as the boron residential time in the melt increases. Aluminum on the other hand, diffuses through the TiB2 layer and reacts with boron to form AlB2 behind the TiB2 layer. During solidification, aluminum crystallizes on this in situ formed TiB2 layer. The interface between TiB2 and aluminum was found to be clean and free from TiAl3 or any transitional phase. A disregistry of 15 deg was revealed between (111) Al plane and (100) TiB2 plane. These observations suggest that the grain refining effect of boron is most likely due to the presence of this TiB2 layer. When a boron-based grain refiner is added to an aluminum melt, boron particles are released into the melt and a large number of TiB2 crystallites with different crystallographic orientations are formed in situ on the surface of these boron particles. These diverse orientations increase the probability of exposing a suitable TiB2 plane, (0001) planes for instance, having minimum interface energy with a-Al and result in nucleation of aluminum. This may explain why elemental boron show a higher efficiency than the conventional grain refiner with equivalent Ti and B addition levels as reported in the literature. On the other hand, in 1981 Lu, Wang and Kung published a study of the grain refining of A356 alloy in the Journal of the Chinese Foundrymen’s Association. The results shown in Figure 1 are taken from their study. 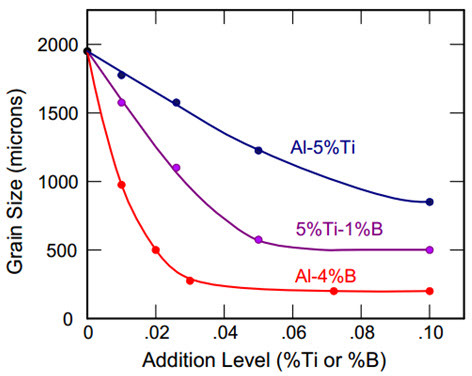 Three different master alloys were added to A356 alloy: Al-5%Ti, Al-5%Ti-1%B, and Al-4%B. The results clearly showed that boron is more powerful than titanium as a grain refiner.